This is the second (and, let's be honest, most likely final) in what will no doubt be our long-remembered "God will not be mocked" series. Last week we talked about playing Little League baseball according to the rules, and the nonsensical nature of a life in which such rules don't exist. This week, Lance Armstrong has tried to create just such a life for himself. Over the weekend, USADA (the United States Anti-Doping Agency) announced that it would ban Armstrong (the seven-time Tour de France champion) from cycling for life and strip the sport's greatest champion of its greatest championship. In addition, Armstrong is banned from being involved in any way (participant, manager, owner) in any sport that subscribes to USADA's governance. All of this comes in response to Armstrong's decision to stop contesting USADA's continued assertion that he used performance-enhancing drugs to win his seven (consecutive!) Tours. Ultimately, whether Armstrong did or did not use PEDs is not interesting to me. It is mildly interesting that USADA has continued their dogged pursuit of him despite his never testing positive, despite thousands of pre-, mid-, and post-race tests. It is mildly interesting that Armstrong was able to win seven consecutive titles in a sport in which almost every one of his major competitors has either been proven to have used, or has admitted to use of, PEDs. What is really interesting is Armstrong's apparent belief that "not fighting" is a good exit strategy. The theological question will ever be: Can you just stop playing the game? In a previous post, we talked about The Belle Brigade's song "Losers," in which they claim that they're not going to participate in the games that make them feel like losers. They're not going to "care about being a winner. Or being smooth with women. Or going out on Fridays. [Or] being the life of parties." This seems to be Armstrong's strategy too: to check out. He might well sing, "I don't care what USADA says about me. I don't care how I'm remembered. I don't care if I can compete athletically anymore." Unfortunately, those declarations don't ring any more true than The Belle Brigade's do. As we've said before, God will not be mocked (Gal 6:7). The Law is true whether we believe in it or not; whether we ascribe power to it or not. USADA has stripped Armstrong of his titles. This is the objective truth. Armstrong can decide, all he wants, not to fight. 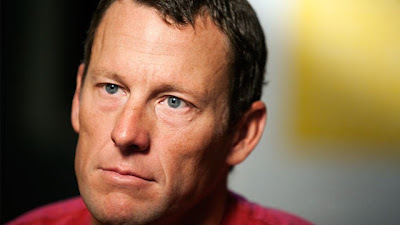 But like a human being denying the authority of God's law, the choice to give up is an admission, as World Anti-Doping Agency president John Fahey said of Armstrong's decision, that the accusation "has substance." Indeed, the rules have substance whether we choose to play the game or not.